After a few weeks farting around, I’m back with another Throwback Thursday Trades and continuing with another Image comic by Robert Kirkman. This week we go back to where it all started for fans of the long running series or fans of the hit AMC drama, The Walking Dead. Watch out for other stiffs and shamble on past the jump. The Walking Dead, smartly enough, first arrived in local comic book stores in October 2003. Written by Robert Kirkman and art by Tony Moore; The Walking Dead followed Rick Grimes as he learns of the zombie apocalypse after he wakes alone in a hospital room from a coma. “Days Gone By” covers the first six issues of the series. If you’re a fan of the show or a fan of the books and have forgotten the first arc (like me), then you may be surprised how quickly the first six issues go. And if you have only watched the show, there are several differences that will still surprise you. The story moves at a brisk pace, definitely faster than the undead antagonists. And The Walking Dead is one of the first mainstream zombie books to really capture the market since the Comic Code Authority was implemented in the 50’s . I’ve been a longtime fan of horror and zombies, so this book was a nice grab back in ’03. As I mentioned in my Invincible Throwback; Robert Kirkman really breaks out with his second Image comic. We’ve seen smaller press comics or even a few references in mainstream comics, but Kirkman was one of the first writers to really thrust us into a zombie apocalypse. That statement alone made this book a must-buy when it first hit shelves. 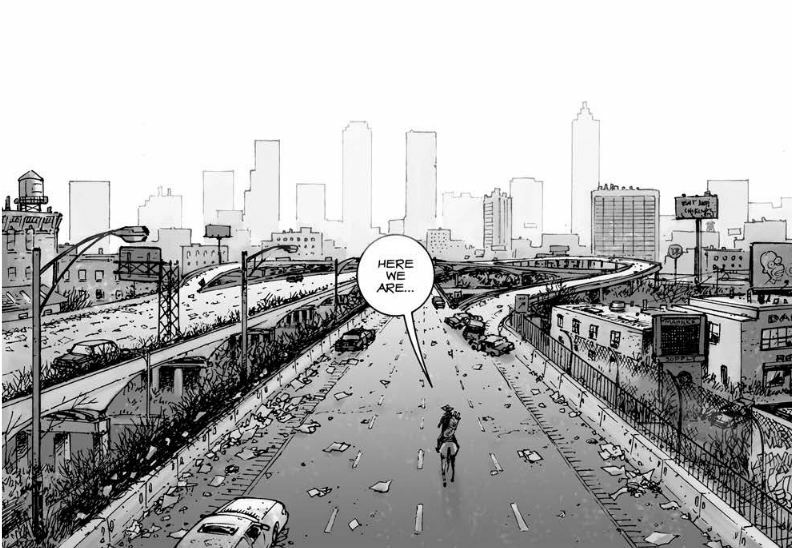 Kirkman also has a fantastic set up to allow readers to really experience the shock and awe of this world he built. In other media, we are usually introduced to zombies in the same way the fictional world is introduced to them. However, allowing Rick Grimes to be in a coma during the first months of the apocalypse allows for another fresh perspective. 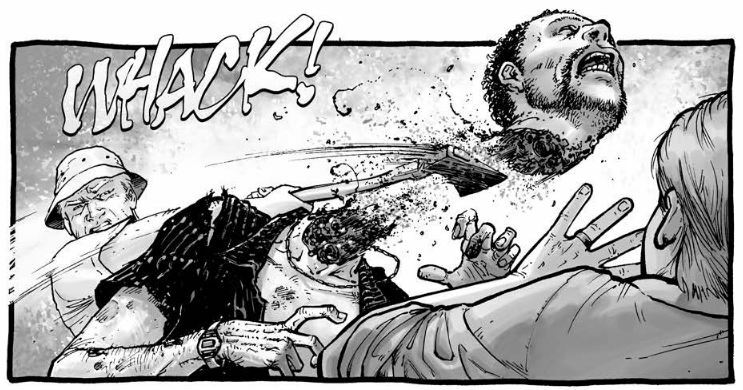 Another talent of Robert Kirkman. 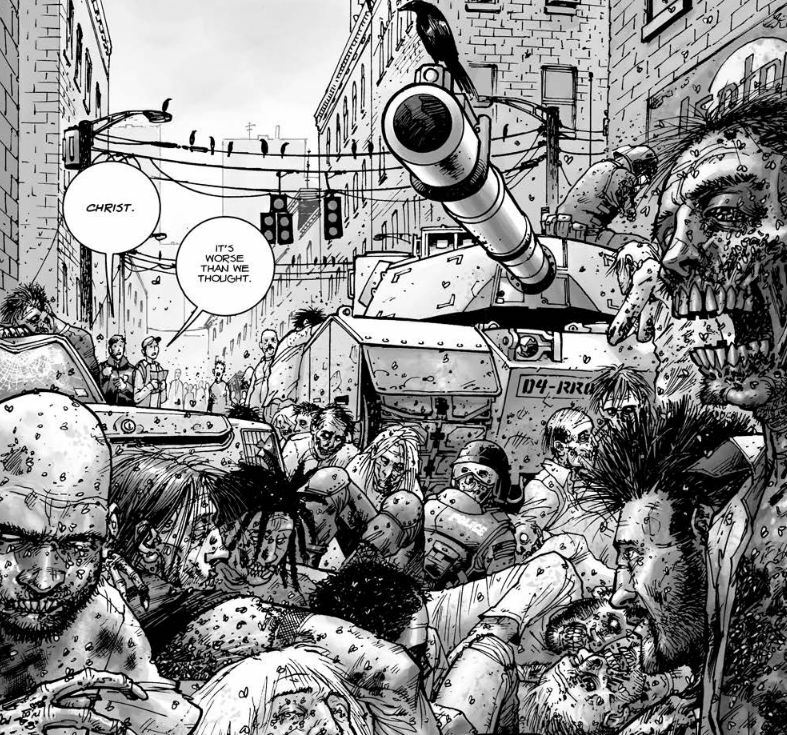 Again, very similar to Invincible; The Walking Dead began with an artist that would soon be replaced by more permanent artist. Unfortunately, in this case it would be Tony Moore that would have penciling duties during the first arc before being handed over. It’s hard to imagine a world without Charlie Adlard working on The Walking Dead; but Tony Moore’s art really stood on its own. After reading the first trade again, I began to miss the dynamic art style of Moore. His faces were detailed and showed a wide array of emotions, his gore was enough to unsettle but not disgust, and he also included onomatopoeia to great effect. The Walking Dead harkens back to the EC Comics era when horror and crime sold comics but is a fantastic read on its own. “Days Gone By” gives us some fresh zombies and is a great way to find out the basis for the hit AMC drama. You can pick up the first trade online or at your local comic book store. Hell; if you’re in the San Francisco area you can head to Isotope to see the man who inspired the corpse in the bottom right of the above picture.